I inked my first real estate transaction in 1999. It was a half-acre of raw land in the U.S. Virgin Islands where I was born and raised. At the time of the purchase, I was living 1,600 miles away in a perfectly located efficiency apartment in downtown Washington, D.C., with great access to restaurants, bookstores, and all of the other amenities a thriving city offers. I hadn’t yet begun to think about buying my first home, but already I had visions of an unfussy, freewheeling beach house dancing in my head. Even back then, I vacillated between my love of urban living and the appeal of bucolic splendor. Not much has changed. Like many people, I have the ability to hold two opposing ideas in mind at the same time. I love living in a walkable, urban environment, but I also harbor the idea of having a really cool, well-designed vacation home where I can relax and enjoy nature with family and friends. And I’m not the only one. The lure of the vacation home is a powerful one for many consumers, clients, and homeowners who dig the relaxed vibe; the simple, open floor plan; and the unfussy finishes that are hardwearing and low maintenance. As a result, these are things architects and builders must keep in mind when pursuing such projects. The appeal of a vacation home is just as much about the location as it is about the architecture and the relaxed living. Settings near a lake or ocean, perched high on a hill, or nestled in verdant countryside are all crowd pleasers. But the house you build there should be a worthy addition that blends in with the surroundings. 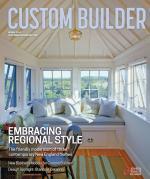 This month, our design portfolio ("Cottage Industry") brings you two great examples of such homes. Located in idyllic settings, each one fuses timeless architecture and details with respect for location. And as contributor Cheryl Weber writes, “they succeed in subtle but meaningful ways”—just what you would expect from a vacation home. Comments on: "Far Away Place"